The Easter Monster challenge was such fun I thought I'd try it on Golden nugget. The challenge is the same. Add a minimum number of Givens so that the resulting puzzle is solvable with at most one advanced move. This is what I found. A single added given doesn't seem to be enough to make the sudoku easily solvable with a single advanced move. Like the other puzzle, the puzzle has already one unique solution but complex techniques are required. But there's something interesting going on, involving some of the 7s in the correct positions of that unique solution. 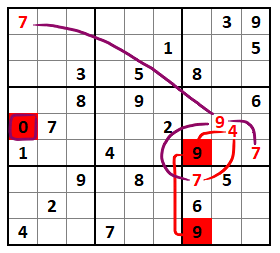 If you set as added given one or more of these 7s marked in red in this picture, they result in a wrong solved cell 9 (or in one case 4) which leads to an error. The given is part of the correct solution, but because of a wrong apply of an exocet, the algorithm breaks the puzzle enterly. I used Andrew Stuart's solver and Duncan's solver to test that. Dan's (3,6)r7c14 (-> several basics + singles) would be third on this list. I actually picked my tactics from Dan's solution, i.e. shooting at trivalue cells from two directions. It means that there are many (most) two-cell combos I haven't tried (or won't), so lots of ground still uncovered -- not sure how fruitful, though, but would be interesting to know. I also cottoned on to the "tactic" of placing extra Givens in positions that can see as many other Givens as possible, but in any event I just put 7 r1c1 and tried every other 2nd extra Given position. What's interesting is that pincering those trivalue cells worked pretty well here, but not with the Easter Monster.